I want more stuff, I want stuff until my closets are overflowing with junk I don't need or want anymore. Ok maybe not, I don't really like junk and always ask for and want practical gifts for Christmas and my birthday. I've been more excited about getting a window fan, pillow, and socks for my birthday than some new or hip gadget I don't have a use for! I know I'm weird, most people want more, bigger and better, everyone wants to keep up with their neighbors (even if they aren't named Jones). Is it wrong to want stuff? 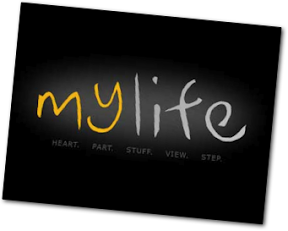 It all depends on your perspective according to this week's message at church: My Life: My Stuff. Chris used the sad but true stories of parents who get caught up in Little League games and forget about the true meaning of the games. He also told the story from Matthew 9:18-26, in which a Jewish ruler comes to Jesus because his daughter had died. In verse 24 Jesus says that the girl is not dead but only sleeping. This was to illustrate how God's perspective is different than ours. I found this message to be right on the spot and something I needed to be reminded of. While the main thrust of the message could be pointed towards worldly materialism on the broad scale, it comes back home when we start looking at the little things we place between ourselves and God. This week, we have begun to see that God being in our lives requires us to recognize that all that is in our possession is His. This is a difficult thing for us to grasp. But, as we follow Him and trust Him, we learn to hold on to things loosely. What things are nearest and dearest to your heart? What things do you hold tightly to the most? Why? What things are easier to release to God? Why? What does it look like to "Seek the Kingdom of God" (Matthew 6:33)? Write a prayer to God about your desire to have a heart that is more like His. Write about what you have learned about God and yourself this week.